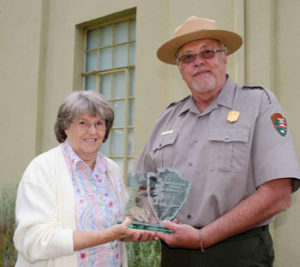 On June 16, 2016, tribal liaison Richard Basch of Lewis and Clark National Historic Trail presented Sharon Stewart and the Friends of Sacajawea State Park with a National Park Service Midwest Region Partnership Award.Volunteer Sharon Stewart and the Friends of Sacajawea State Park were recognized for the many years of work and personal commitment to providing a quality visitor experience to park visitors. Stewart first volunteered at Sacajawea State park in 2000 as a campground host. Since then she has worked tirelessly in a variety of roles to support park operations and make the site a meaningful experience for the public.The Friends of Sacajawea State Park was founded as a nonprofit in 2013 to support the park and formalize the large community already volunteering with the park, and has weathered many challenges to continue park operations undisturbed. The volunteer-driven group has served thousands in the Tri-City Area, including many school children who received a fun and educational look at the history of the area. The Friends of Sacajawea State Park volunteers are always ready to give interpretive tours of the park. From the Lewis and Clark National Historic Trail 2016 Annual Report, National Park Service.